Spring Ridge is located in the Salmon River Mountains near Banner Summit. The ridge runs north to south, starting near Bull Trout Lake. 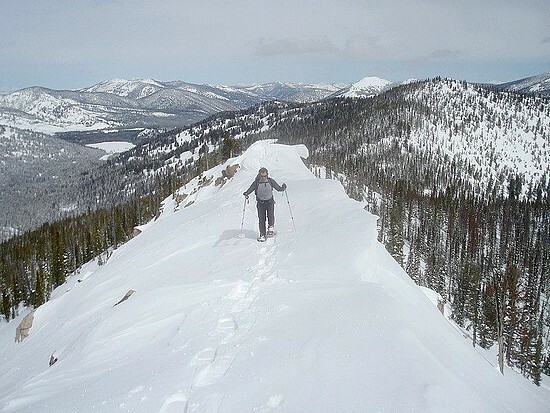 It makes for a good snowshoe destination since it climbs gradually with minimal avalanche risk. There are two peaks on the ridge. “North Spring Peak” is about 3.5 miles from the trailhead, and “Spring Peak” is another 1.3 miles in. Choose one or both depending on your motivation level. After much deliberation (a bit more than usual), Splattski came up with the idea for tackling Spring Ridge. The 2.5 hour drove to Banner Summit was shorter than some of the other options we’d discussed, and we wanted something safe since avy danger was a bit on the high side. We left town at about 5:15 and were on our feet by 7:45. There was a trail broken for the first quarter mile to a weather station, but we were on our own after that. We began winding our way up through the trees. We were sinking in to mid-shin, which wasn’t too bad, but still a fair amount of work as we made our way through the forest. Our pace wasn’t great, but the weather certainly was. It took us over three hours, but we made it to the summit of our first peak in about three hours, under with an abundance of blue skies. From North Spring, we could see the slightly lower Spring Peak not too far in the distance. But to get there we had to drop almost 500 feet, and then climb back up the other side. So down we went, not looking forward to having to climb back up on the return trip. But at least there’d be a nice trail broken in. As we made our way up the final ridge, we could see a bunch of avy debris that had fallen off our route to the left. To the right were some steep rocky cliffs. In the middle was some rotten sugary snow that wouldn’t support our weight. Needless to say, all of this kept our attention as we made our way carefully to the summit. The summit of Spring Peak was a great spot to take in the views of the Sawtooths. We hung out for a full half hour eating lunch and soaking in the scenery. We had a good time trying to identify the distant peaks from this new vantage point. Eventually we heard the clock ticking and started heading back. Our pace wasn’t much quicker than the way in, thanks the undulating ridge that mixed in a fair share of uphill sections. Round trip for this great day in the mountains was a full 8 hours. Map or our route, 9.5 miles round trip and 3100' total elevation gain. Wandering through the forest early in the hike. Making our way along the ridge towards North Spring (center) and Spring Peak (right). A cornice we crossed on the ridge. Looking south towards North Spring Peak. Snow covered trees near the summit of North Spring. North Spring Peak summit shot, splattski style. Great views of the Sawtooths from the ridge. A view of Spring Peak from North Spring. Cornices on the north ridge of Spring Peak.